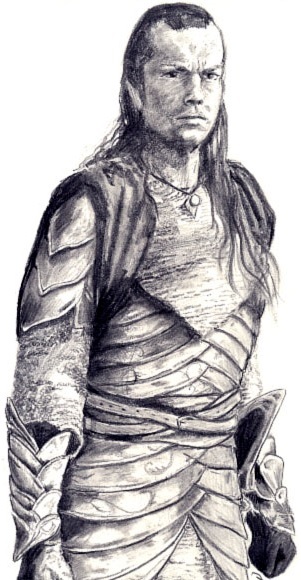 Elrond - Elrond is one of the longest-lived characters in Middle Earth. He and his twin brother, Elros, were born to Eärendil & Elwing shortly before they left on their voyage to Valnor. It was because of this journey their parents made that these children of both Elves and Men were given the choice of which path to follow in their lives; either that of the Elves, or that of Men. Elrond chose the path of Elves, and so was granted the gift of immortality. He was born near the end of the Third Age, and has no personal knowledge of most of the events of that time. However, he was alive during the climactic battle of that age (see War of Wrath below), and makes an interesting comparison between it and the Siege of Barad-dûr (at the end of the Second Age) at the Council of Elrond. He is also founder of Rivendell, which was established in the Second Age as an outpost to keep watch on Sauron. Although only a secondary character in the history of Middle Earth, he is the only figure to appear in each of the sagas of that land (that is, The Silmarillion, The Hobbit and The Lord of the Rings trilogy. He also appears in the Unfinished Tales, but not The Children of Húrin, which took place shortly before his birth).